this property is a graceful two-story apartment surrounded by meadows and by green hills. It sleeps six people. It is approximately 90 square meters (970 square feet). It features a shared swimming pool, a private patio, a shared garden, winter heating and WI-FI Internet access. You will be roughly 3.5 km (2.2 miles) from Camucia di Cortona, where you will find restaurants, shops and public transportation. You will find the closest restaurant at 3 km (roughly 1.9 miles) and a grocery store at 2.5 km (roughly 1.6 miles). this property is located on the ground floor of an age-old stone house. You will reach it from the parking area without having to climb any steps. To stay at this property you will need a car. You will be able to park it on the premises, in a reserved parking space. this property is one of the holiday homes available in a small complex. Please find a general description of the complex below, and please scroll further down for a description of this property. The Livio apartments are 4 apartments that are distributed in two beautiful stone buildings. 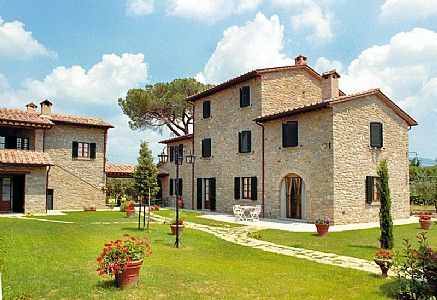 The two buildings are located in the Val di Chiana, in a quiet position, high enough to let you enjoy a beautiful view of the Etruscan city of Cortona. In a higher and more isolated corner, you will find a beautiful swimming pool. The swimming pool is 7 meters (23 feet) large by 14 meters (46 feet) long, from 1 meter (3.3 feet) to 2.5 meters (8 feet) deep. The area is equipped with a table, chairs, sun umbrellas, deck chairs and an external shower. From the swimming pool you will have a pleasant view of the surrounding countryside. You will share the pool with the other guests staying at the complex. The swimming pool is open from the beginning of May until the end of September. The garden is 300 square meters (3230 square feet) large. It is partly shaded by trees and by gazebos. It is equipped with a table and chairs. In the garden you will find a children's playground. The garden is shared with the other guests staying at the complex. The patio is 20 square meters (215 square feet) large. It is partly shaded by a roof. It is equipped with a small wickerwork sofa and an armchair and with a table and chairs. Here you will also find a portable barbecue. You will be able to enter the living room from the kitchen through a brickwork arched opening. The floor is paved with Tuscan terracotta tiles. The ceiling has characteristic exposed wood beams and terracotta tiles. The furnishings are simple and comfortable. The furnishings include a divan that unfolds into a double bed. You will be able to enter the kitchen from the living room through a brickwork arched opening. It is equipped with a four-burner gas cooker, an electric oven, a refrigerator with freezer, a dishwasher and an Italian-style coffee-maker. There is a nice fireplace made of bricks. The dining table can accommodate six guests. The kitchen is also equipped with a satellite television (local channels). From the kitchen two French doors will take you to the patio. The room has a window. You will be able to enter the first bedroom from the corridor. The bedroom has a matrimonial bed (160 cm/62 inches, wider than a queen-size bed). The room has a window with a view of the garden. You will be able to enter the second bedroom from the corridor. It has two twin beds (80 cm/32 inches). The room has two windows. You will be able to reach the laundry room through an access area. Here you will find a washing machine at your disposal. This villa, in Camucia-Monsigliolo, boasts a gorgeous valley view sleeping 6 people.